The author dispels the myth propagated by the anti-Modi brigade with first-person accounts, facts & evidence. As Modi prepares to defend his performance and government in 2019, this book will arm his supporters with a plethora of information that they can use to help him along the way. India’s Prime Minister Narendra Modi is the most vilified politician in India in the last two decades. 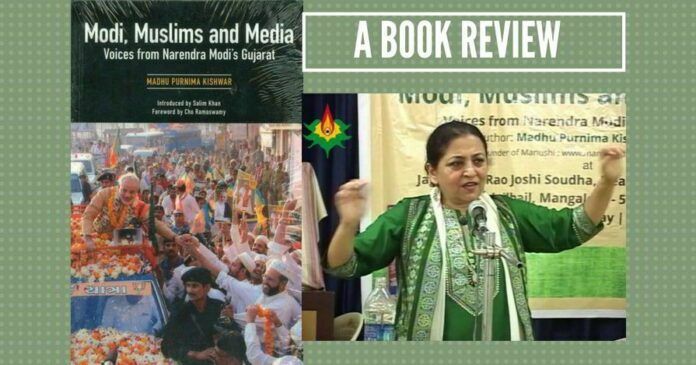 Much to the chagrin of his detesters (and they are available for dime a dozen these days), Madhu Kishwar has unveiled hitherto unknown facts about Modi in this book whose tagline reads “Voices from Narendra Modi’s Gujarat”. My previous experience of reading about Gujarat riots is through Communal Rage in Secular India by Rafiq Zakaria back in the early 2000s. The book is a mixture of liberal concoctions from a wide array of media reports, including the article by Arundhati Roy which till date serves as an epitome of fiction and filth. With a foreword by Amartya Sen – the name alone is a harbinger of intellectual dishonesty, there’s not much to expect in terms of facts. Although the author devotes an entire Chapter on “What Should The Muslims Do” offering prescriptions to his own community to integrate with the mainstream and shed the ghetto mentality, the scholarship and the due diligence vis-a-vis literature on the riots are grossly missing. Maulana Isa Mansuri did not let Modi speak for an hour; he spoke in the harshest tones and words. But Modi did not interrupt any of them for a minute. By contrast, Madhu’s book is predicated on facts, augmented by cross-verification of the same; interviews and video recorded conversations all add to the depth and credibility of the information presented. The holistic approach she took to studying the functioning of his government before and after the riots, including highlighting the stellar earthquake disaster relief work under Narendra Modi, is a lesson on investigative work to several established and aspiring journalists. Forewards by the late Cho Ramaswamy and Salim Khan is an appropriate segway into rest of the book. Having been bred the usual dose of Modiphobic content in cross-section of the media, She sets out answering many questions and pointing out several good facets of his administration completely ignored by the mainstream media. She dispels the myth propagated by the anti-Modi brigade with first-person accounts, facts & evidence. Worth repeating: first-person accounts, facts & evidence. She quotes extensively from a number of people who came in contact with Modi vis-a-vis riots. She starts with the account of Zafar Sareshwala and Maulana Isa Mansuri meeting with Modi in London in August 2003. The meeting was arranged by Mahesh Bhatt, on the request of Zafar Sareshwala, through Modi’s good friend Rajat Sharma. In fact, it was Mahesh Bhatt who encouraged Zafar to “start the process of engagement with Modi”. Yes, that’s right. It was Mahesh Bhatt! She also reveals quizzical and hypocritical nature of Mahesh Bhatt. Mahesh Bhatt never took on that offer. One wonders if Mahesh Bhatt’s concerns for Muslims are genuine. This was in 2005, three years after the riots. It certainly was a pleasant surprise to learn about his disaster relief work and how it resulted in becoming a global role model. V.V Augustine from Kerala, member of National Minorities Commission, represented Christian Community of Vapi who have been trying to get a burial ground for the last 40 years. None of the previous administration listened to them. It was Modi who sanctioned them a ground. Madhu dispels the myth about Modi with elaborate accounts from a variety of sources. It is important to note that Modi was the first CM to have given a riot-free decade in Gujarat. A riot-free decade in Gujarat? Yes. Modi had much to navigate and learn about governance and administration during his initial days and months as Gujarat Chief Minister. Madhu reproduces an English translation of Modi’s first speech as CM. She says, “It has no bluster, no divisive rhetoric, no communal appeal”. Madhu Kiswar details his efforts on earthquake rehabilitation work, his focus on development for all and his opponents efforts in discrediting him at every step, fostering false charges & accusations using an ecosystem consisting of political parties, politicians, NGOs and in few cases colluding with his own enemies in BJP, VHP, Bajrang Dal and RSS! It certainly was a pleasant surprise to learn about his disaster relief work and how it resulted in becoming a global role model. This fetched few international awards! She also lists few countries that benefitted from Gujarat’s relief and rehabilitation knowledge and experience. Modi government even offered to sponsor 2 Ph.D.’s per university nationwide for students to conduct research on relief and rehabilitation, but none of the Chancellors took up the offer! Modi’s victory in the by-election on 25th February 2002 knocked the living daylights out of Congress due to overwhelming Muslim support for Modi. This was just 2 days before Godhra train massacre. Isn’t it natural to draw a parallel to this day in 2018? She dedicates an entire chapter on the Godhra train massacre, quoting extensively from Justice Nanavati Commission report and also opining on the illegal Banerjee Committee appointed by UPA. Plenty of references to newspaper reports and headlines of those times highlighting the bias and prejudices of the media community at large. She adds: “…very few are aware that the Nanavati Commission and the courts found Godhra violence to be the handiwork of mischievous elements within the Congress Party who also allegedly had links with Pakistani outfits”. Modi supporters must take cognizance of this and expose the Congress further. It is well known that the mainstream media played a selective role in reportage. There were many incidents that were painted differently or altogether ignored. One such incident is narrated by India Today correspondent Uday Madhurkar over the phone. The author narrates several accounts of relief work undertaken following the riots. None of them point to any bias. He proceeds to point out two more such incidents that provoked the Hindus. She exposes the flippant attitude of Congress when two of its State Governments refused para-military support which was requested by Gujarat Government. The NGO network worked overtime to blame Modi and paint him as a modern-day “Nero”. Rias Khan, a former associate of Teesta Setalvad had many things to say about the bias. Why is this a well-researched book? First, on Gujarat riots, the author uncovers facts. She lists out Modi’s preventive measures, army deployment, day-wise actions the first week of the riots, and relief and rehabilitation measures in great detail. Modi’s response to the riots added to the agony of the anti-Modi ecosystem. She exposes the anti-Modi ecosystem thoroughly by bring out facts of tragedies that were “spiced up” and dismantling popular media distortions. Second, the book cites several examples of his administrative capabilities, inclusive development, various skill development initiatives, his penchant for participatory development all the way from 2001. One can certainly relate this to his current focus as PM. What one will learn about Modi are his work ethics, far-sighted thinking, result and an outcome-oriented mind. This is a must-read book for his supporters. As Modi prepares to defend his performance and government in 2019, this book will arm his supporters with a plethora of information that they can use to help him along the way. Cho Ramaswamy is absolutely right. The book is “unputdownable”. best part is it is not based on imagination of some biased journalist but actual video taped interviews and proof. Undoubtedly a great book. I have a preserved E copy of this wonderful work the wonderful writer Ms MadhuKishwar. It reflects the dedication of Our Prime minister. PappuG should be made to memorize this book before the general elections in 2019. Despite the best of PM Modi’s best of intentions in the National interest and his track record as CM Gujarat,he has chewed more than he can swallow right after assuming power. People are really disillusioned with a deluge of multiple promises/programs,most of them not bearing fruit.On the other hand while a dose of sentiment can assure votes same is not possible with stress on only DEVELOPMENT which takes time to be visible.Sadly people have totally forgotten their daily Congress torture of never ending queues for every service/consumables consumed by a hurry to have all in a day. In addition this Nation is destined to remain DEVELOPING for ever with caste/community/faith/gender/language/regional divides/exceptions practiced in RESERVATIONS,loans,subsidies,incentive,education,training;in every field w/o a chance for merit to be awarded. The hardworking GENERALS are negatively discriminated while the solemn declaration of EQUAL OPPORTUNITY is confined to the Preamble,followed in its breach. With 50% eligible,meritorious getting sidelined w/o even a chance of fair competition,succumbing to State sponsored MEDIOCRITY this Nation cannot become DEVELOPED. PM Modi will do well to look into this aspect next time if at all he is not sacrificed by scheming/divisive/ambitious/disparate elements. This book would only fortify the believe of many in Modiji. India is definitely on a new journey that cannot be led by any other then Narendra Modiji!